This Pakistani election is being seen as epochal and singular. As with others, there have been deaths, disruptions and accusations, the cries of an ill patient. Some 31 perished in a suicide bombing attack in Balochistan, predictably against a polling centre. But as the night chugged and throbbed with anticipation, the PTI began to lead at the half-way mark of counting with 113 seats. In one sense, he is practical, keen on pursuing matters of governance rather than issues of ideology: Do not, for instance, remove blasphemy laws because doing so would release the lynch mobs. Those misusing such statutes would be punished. The orderly function of institutions is paramount. He is far from keen to box the Taliban from diplomatic engagement and shackle the mullahs. “For sixteen years,” he explained to Peter Oborne in an interview last year, the United States had “been trying to use [the military] to crush the Taliban movement and it has failed. And it will fail again.” Sentiments of sympathy have been expressed for Afghanistan, a country with which he wishes to have open borders. There have been bread-and-butter promises served with a populist crust. Institutions will be held accountable in an effort to fire lagging trust; farmers and the business community will be assisted; tax revenue will be “safeguarded” (always comforting); youth employment shall be encouraged, and government expenditure will be reduced. A lingering, if crippling wisdom suggests how careful Khan will have to be. 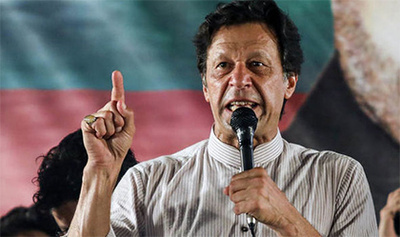 He has been – and in an era that spawns the likes of Donald Trump, this should hardly be surprising – injudicious with his opponents, berating those supporting former prime minister Nawaz Sharif as “donkeys”. A coalition will probably have to be sought; the sagacious manner displayed by him whilst cricket captain may well have to apply. Overseeing the process of politicking and any effort at reform will be Pakistan’s meddling army, that self-proclaimed agent of stability that has done its fair to ignore elected representatives when it wanted to. That particular institution, argues Hamid Hussain in the Defence Journal (Jul 31), “views itself as a doctor that needs to administer medicine to the sick patient from time to time for the good of the patient even if he does not like the taste of medicine.” The new leader will just have to be mindful such medicine doesn’t have the effect of finishing off a patient of such ill-health. For the moment, it seems, Khan is in the good books of Dr Military.